We are back from vacation! It was a lovely three weeks....a time of relaxation, hiking, fishing, crabbing, berry picking and looking at the view! 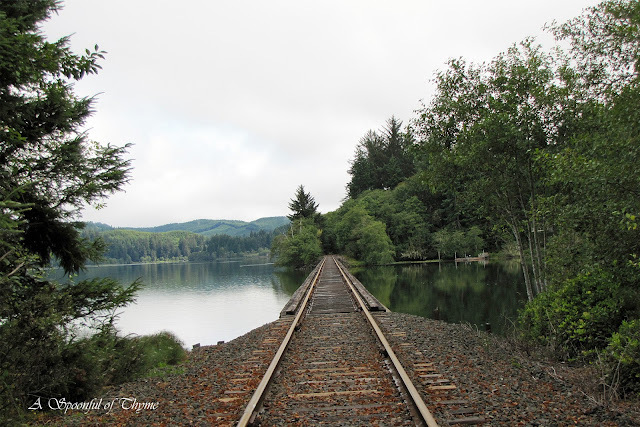 Siltcoos Lake, Oregon is our favorite spot to get away from the world. We stay on the backside of the lake....there is a beautiful drive from the coast to this isolated spot....we travel down a one lane, winding road but to us, it is worth the drive. While we were in Oregon, Mr. T. visited a friend in North Bend to do a little salmon fishing and, wow, he caught a 34 inch King Salmon! I see some great salmon dishes in our future. Prior to the big catch, we visited the Oregon Lox Company outside of Eugene and purchased some yummy lox and smoked salmon. 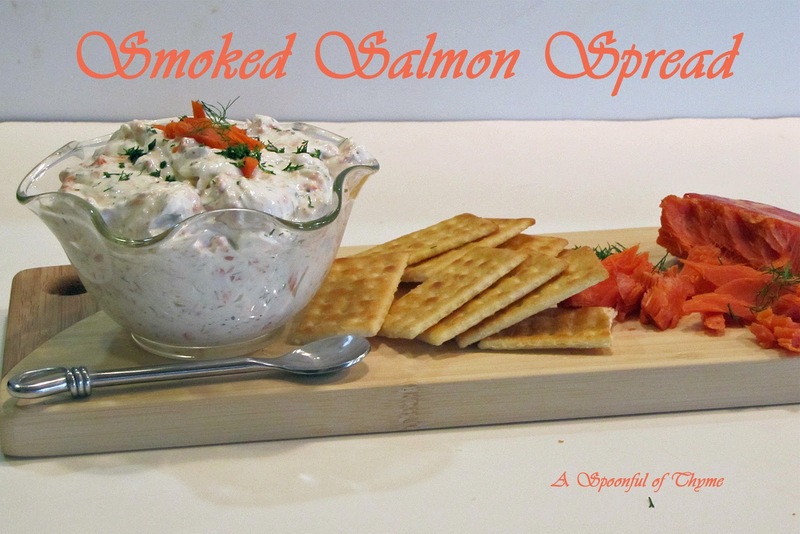 I had a little left when we got home so I put together this Smoked Salmon Spread for us to enjoy. Using an electric mixer with a paddle attachment, cream the cream cheese until just smooth. Add the sour cream, lemon juice, dill, horseradish, salt, and pepper, and mix. 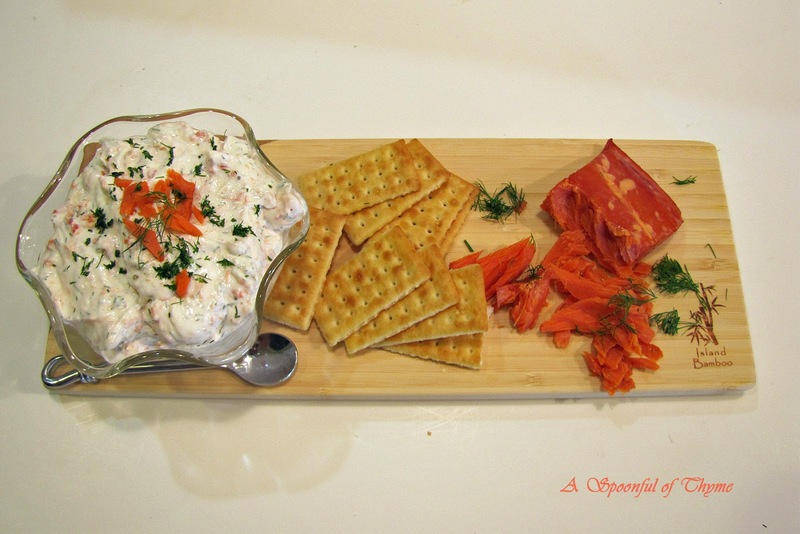 Chill and serve with crudities or crackers. Making the spread in advance and allowing the flavors to meld makes a difference. The flavor of the dill jumped out in the leftovers that I managed to snack on the next day. Mmmmmm. 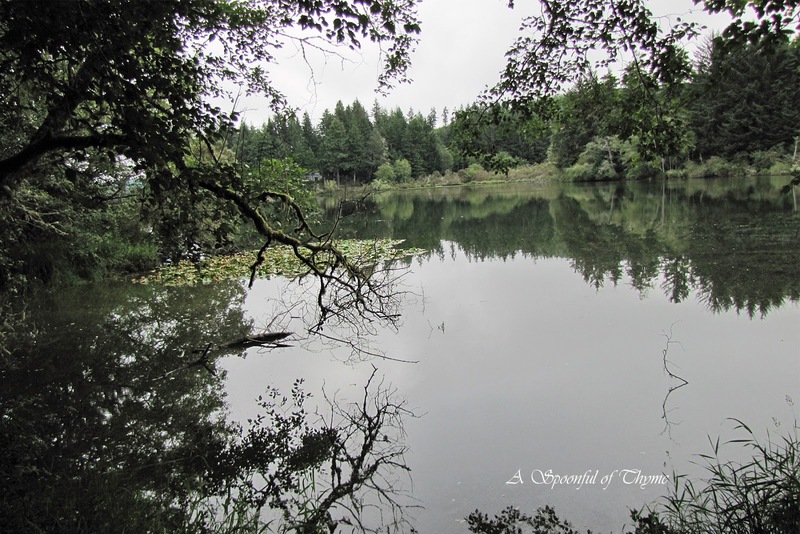 Looking forward to our next trip to Siltcoos Lake, Oregon! I am participating in Full Plate Thursday hosted by Miz Helen's Country Cottage. Butterscotch Cookies with Brown Butter Frosting! 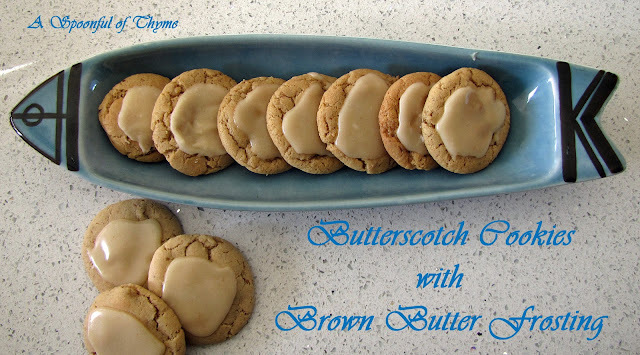 I have been doing a dance with brown butter cookies...I know that the perfect recipe is out there somewhere and I will eventually find it. 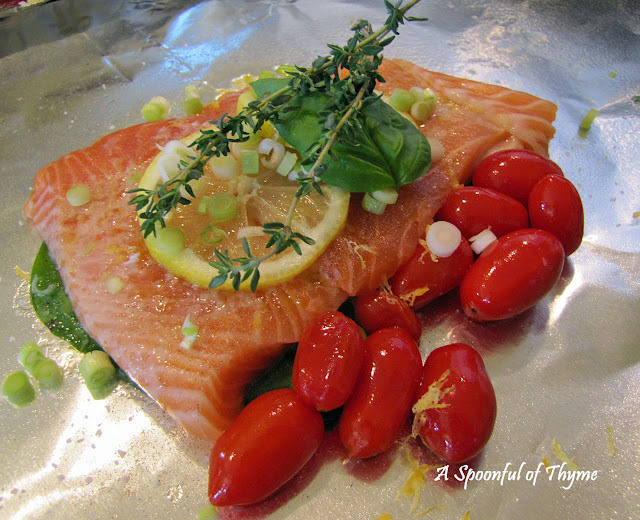 While on my quest, my friend, Chris, (who is a fabulous cook) suggested that I give this recipe a try. It was passed to her by a friend who received it from a friend...you know how it goes....Chris has never stirred me wrong so I decided to give it a try. 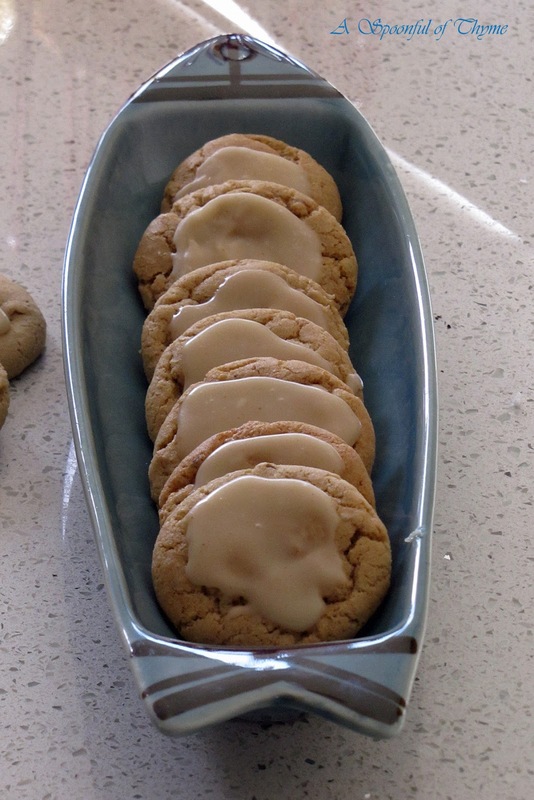 While it is not a true brown butter cookie, it does have a brown butter frosting that is really yummy. They have been added to the list of cookies I must make around the holidays...of course, I intend to try them a few times before the holidays, too! Sift flour with baking powder, baking soda and salt into a bowl and set aside. Cream butter, add brown sugar and cream well. Add the eggs one at a time mixing well after each. Add the sour cream and the vanilla. Add the dry ingredients and mix. Chill for an hour. Scoop cookies onto a cookie sheet and bake at 375° F. for 10 minutes. Brown the butter in a small saucepan. Remove from heat. The cookies were delicious...nobody could walk by the jar without getting at least one for each hand!! Once again I borrowed one of my son-in-law's collectibles to use for the picture....isn't it cute? It was designed by Swedish ceramicist, Lisa Larson in 1958. I am participating in Full Plate Thursday hosted by Miz Helen's Country Kitchen and Foodie Friday hosted by Michael at Rattlebridge Farm. Have you ever noticed how a recipe can become a totally different dish just by switching out a couple of ingredients or presenting it in a different way? That's what happened to the Mexican Bean and Corn Bake that I found on Judee's blog, Gluten Free A-Z Blog. You may remember that I made Watermelon Smoothies from Judee's blog in May for The Secret Recipe Club. Surprisingly, I was assigned Judee's blog for August! What a treat! Judee raved about the bake and suggested that it could be served with corn chips, sour cream, guacamole, olives and jalapenos....wow! 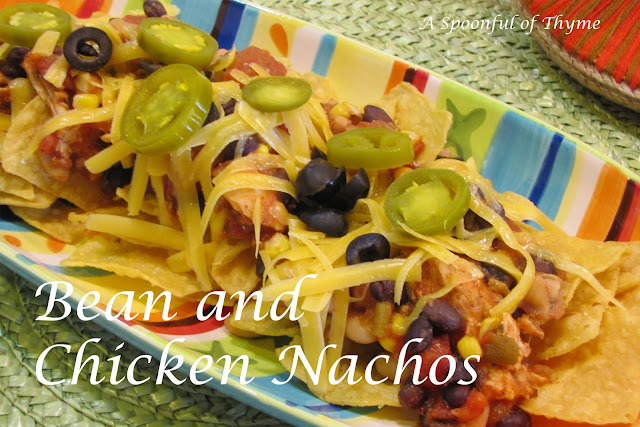 I certainly couldn't resist the vision that I had of a platter of yummy nachos! I added some shredded chicken, spiced up the tomatoes, and tossed in some onion and chiles! So tasty!! Poach the chicken breasts in chicken broth. Shred. Heat 1 tablespoon of oil in a fry pan. Saute the onion and the garlic. In a large pot combine the chicken, sauted onion and garlic, and all other ingredients except the cheese. Heat through. 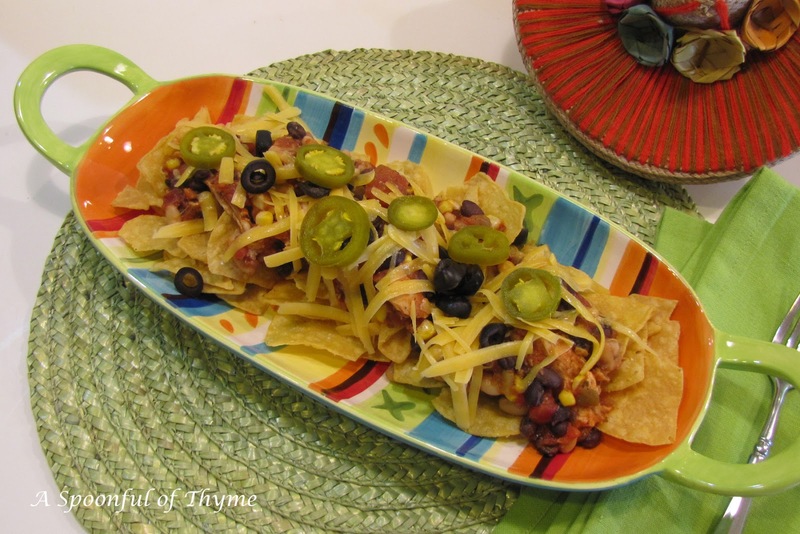 Spread tortilla chips on a platter. Spoon the heated chicken and bean combination over top of the chips. Sprinkle with cheese and pop under the broiler until it melts. Serve with avocados, sour cream, sliced pickled jalapenos, black olives, pico de gallo or salsa, if desired. We enjoy a platter of nachos now and then and these became a great, quick dinner.